Noahpinion: Sadly, macroeconomics IS based on common sense. Sadly, macroeconomics IS based on common sense. As Donald Boudreaux, professor of economics at George Mason University and author of the invaluable blog Cafe Hayek, puts it: "Macroeconomics was nothing more than a dismissal of the rules of economics."... "All economic problems are about removing impediments to supply, not demand," Arthur Laffer reminds us. I won't bother to rebut the article, since David Glasner and Paul Krugman do a good job of it. I just want to add two points. First of all, a minor point. Students do not hate macroeconomics because it is counterintuitive. They hate it because it has more math than they expected it to have. A lot of econ students are business majors who simply don't think of themselves as "math people," and are surprised to find themselves in an applied math course. But this is kind of unavoidable; since so much of business requires math skills these days, MBA types will have to toughen up some time, and econ classes are as good a time as any. Cheer up, business majors, taking derivatives builds character! But anyway, on to my main point. Moore is wrong; much of macroeconomics is, in fact, based on "common sense" very similar to Moore's! I am referring, of course, to the "neoclassical" (or "freshwater" or "RBC") school of macro, whose theories have more-or-less dominated the field since the early 80s. These theories use plenty of math, but no more than their chief rivals, the Neo-Keynesian theories. The reason neoclassical models retain such popularity is that their assumptions are considered plausible by many economists - in other words, the assumptions seem like "common sense." What are those assumptions? Well, they're pretty much the same as Stephen Moore's! "Real" business cycles are assumed to be driven by supply shocks, as Moore feels they must be. These supply shocks can take the form of technology shocks, or changes in people's willingness to work - as in Moore's example of his lazy son, unemployment in freshwater models is often a result of people deciding to "sit on their duff." As for taxes, neoclassical theorists assume that the Frisch elasticity of labor supply is really high, meaning that income taxes strongly discourage people from working. And neoclassicals assume that fiscal stimulus causes people to anticipate higher future taxes ("the money has to come from somewhere! "), rendering stimulus ineffective. To reiterate: 1) All of these assumptions are exactly the same as Moore's "common sense." 2) Models that use there assumptions are widely accepted because the assumptions are considered plausible - i.e., because they are "common sense." And 3) The implications of these models - that fiscal stimulus, taxes, and unemployment benefits are bad for the economy - are exactly what Moore's "common sense" leads him to conclude. In other words, Stephen Moore's intuition has allowed him to reproduce much of freshwater macro in his head. 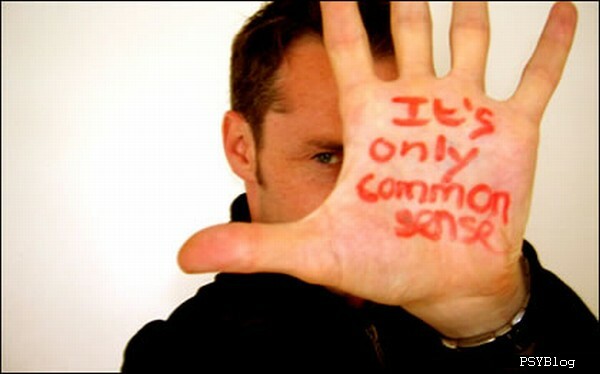 Should we conclude that common sense is in fact a very good tool for understanding the economy? Or should we conclude that the highly formalized math of freshwater macro is little more than window-dressing for a conservative worldview that people believe in because it just sort of feels right? I tend to lean towards the latter, given how little use common sense has been in the development of physics, chemistry, biology, and psychology. But who knows. Maybe I am wrong, and economics is in fact simpler and more intuitive than the natural sciences. In any case, Stephen Moore should cheer up. Every business-cycle theory that has won a Nobel Prize since 1981 is squarely in line with his common sense. To dwell on your minor point a little longer: I also want to point out that students say they hate "economics" not specifically macroeconomics. Moore seems to be drawing the conclusion that when these hypothetical students say they hate "economics" they are saying that they love microeconomics but hate macroeconomics. The apparent level of divergence in the right is really remarkable at the moment. It seems like nobody is even willing to agree on basic facts. When unreasonable amounts of uncertainty are injected into otherwise accurate data, no reasonable conclusions can be drawn. You're correct that "Students do not hate macroeconomics because it is counterintuitive". However, in my experience, when trying to explain macro concepts to people who are not students, the problem is counterintuitiveness. For example, I have tried repeatedly to explain the concept of a multiplier to an acquaintance of mine. He is probably better at math than I am, and in any case multiplier math is simple. Nevertheless, he absolutely refuses to believe that anything like a multiplier can exist on purely "common sense" grounds. Since Moore's article is, according to the headline, about Americans and not just students, I think it's fair to say the general public gets finds it counterintuitive. Sadly, this sounds a lot like the "experts" who said that it was just "common sense" that a heavier-than-air craft couldn't fly, or before that that a ship made from steel couldn't float. Prejudice and intellectual laziness shouldn't be confused with common sense. It is not an assumption of these models that the Frisch elasticity is high. Not saying I'm a huge calibration fan, but these parameters are chosen to match facts in the data. It's not a political choice. But I don't see how you're not doing exactly what you're claiming others are doing. You basically assume that fiscal stimulus should work and that demand shocks generate recessions (along with some assumption about labor supply elasticities being low which actually is an empirical claim). I guess whatever model you use (what models are you using again??) is just a window dressing for your own political view points. What's the point of these posts anyways? Obviously Moore's article is embarrassingly bad and rightfully ridiculed. But then why jump over and bash the motives of all macroeconomists? If you are confused about why macroeconomists use the models they use, why don't you go ask one. You're at a good school, shouldn't be too hard to find one. Donald Boudreaux's comments make me laugh. A dismissal of the 'rules' of economics? I guess he's the kind of guy who refers to demand and supply as 'laws', too. If you have a mathematical theory then the predictions are only as good as the assumptions. One of the common implicit assumptions is that the model includes all of the relevant and material mechanisms. There also seems to be a tendency to fall for what I will call the string fallacy - the belief that if quantity A can "pull" quantity "B" then quantity "B" can push "A". In my thirty years of empirical experience, higher taxes generally causes people (at least the self employed) to work more/harder, rather than less. Any formal studies purporting to show the opposite should be viewed with caution. If the Chicago school's assumptions are wrong then their theorems are irrelevant. It is virtuous for each of us to save, therefore if we all simultaneously try to save substantially more today than we did yesterday, only good things could result. What I find odd about this sort of "common sense" is that it seems to rely on faulty metaphors more than anything else. Everybody understands (by "common sense") that a crowd can make a fairly smooth and orderly exit from a ballpark, but a sudden panic will create a traffic jam. So why would a bank run or liquidity crisis be so counter-intuitive? Why would a demand shock be counter-intuitive? "The implications of these models[...] are exactly what Moore's "common sense" leads him to conclude." While this may be true, the fact that common-sense answers don't necessarily follow from common-sense assumptions is just as important. Seeing as you mention maths -- and though its application certainly has its downsides -- one of the great virtues of laying out an economic theory in mathematical form is that it allows you to fully work through a set of a set of relationships to a logical conclusion, which may not be intuitively obvious. Intuition and common sense turn out to be pretty limited in scope when you are dealing with a complex set of interactions. For instance, how much empirical data is presented in econ 101 to support the law of supply and demand ? my textbook talked about a tomato market in a central american village; thats the best you can do ? or take the portrait of macro given in zombie economics, starting with say: it is a story of one religious theory after another; each theory gets shot down when the epicycles can't be computer. I think, at some level, intelligent people don't go into the field - smart people, who can do math, do, but intelligent people don't. If it were science, we wouldn't have nobel prize winners calling eachother idiots (roughly, very, lucas vs krugman) or nobel prizes awarded to things that are wrong, or people (black scholes) who are famous for things that are wrong. A small point, but significant in the overall spinning of memes and narratives to support current Rentier class that Stephen Moore has dedicated his life to. Adam Smith, as "the Lost Legacy" of Adam Smith used the metaphor "invisible hand" to illustrate a very particular and fact specific situation in the late 18th century economy to illustrate why merchants preferred domestic investment over overseas investment, not as general rule. It was Paul Samuelson who made the term the iconic for a free market economy versus a "command and control" socialist economy. So when Stephen Moore starts is column by referencing "Adam Smith's" invisible hand, he knowingly or unknowinlgy starts with a lie.
" A small point, but significant in the overall spinning of memes and narratives to support current Rentier class that Stephen Moore has dedicated his life to. " This is the most important point of the whole discussion. Moore is a liar, propagandist and wh*re. That's his job - his career. The WSJ editorial page has been the same since the early 70's, and has been wildly successful. The biggest problem with economics is that a number of professors at elite schools could be described in the same way, and their colleagues seem to be good with that. Since I'm the non-econ, non-math person here (BA in history, JD), let me just say that I think one of the things I HATE about the neoclassical/RBC/Freshwater folks (someone really need to settle on a name) is that they can't tell a story that matches to reality. The problem is Obama's health care plan that hasn't taken effect? Huh? It hasn't gone into effect? Contrast this with Richard Koo's explanation of "balance sheet recessions" and it's not even close. In terms of being able to tell a story that: 1) matches what actually happened; and 2) is able to make accurate predictions (ie re: interest rates remaining low, the persistence of the slump, etc. ), the balance sheet/liquidity trap folks make more sense hands down. Taryn, they have settled on a name. It's Economics. The division between "freshwater" and "saltwater" ended 30 years ago. If you knew anything about modern macroeconomics, you would know that nothing you posted is correct. Ignorance is sad, and you've got plenty. Noah, on the other hand, should know better. You should be counting your blessings that the old style oral examination by the entire faculty isn't used anymore, because Chris and Rudi would eat your lunch. Has there been any comments by 'Anonymous' which aren't simple sh*t? It's hilarious to watch these guys. "Noah, on the other hand, should know better. You should be counting your blessings that the old style oral examination by the entire faculty isn't used anymore, because Chris and Rudi would eat your lunch." Yeah, Lucas once wrote about giggling at Keynesian models. And after it all came crashing down, he still is - because he's not accountable to anybody or anything, and doesn't have to change. Creative destruction is for the little people. However, I at least know that Anon is not personally acquainted with the Michigan macro department, since he would then know that the scariest and toughest examiner, far and away, would be Dmitriy Stolyarov. "... the one angry anonymous blog troll I know eventually turned into a perspicacious and insightful blogger"
Anger is often a reliable indicator of motivation. Anonymous just has to figure out that anonymous sniping at anyone they consider to be wrong on the internet (WOTI?) doesn't earn any accolades. Come out of the shadows and maybe your co-religionists will applaud your vigorous defense of the true faith.